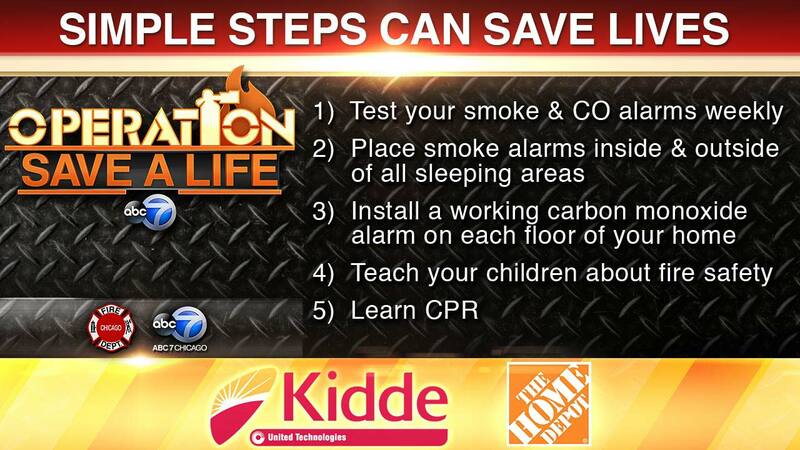 CHICAGO (WLS) -- ABC 7 Chicago; The Chicago Fire Department; Kidde, a leading manufacturer of fire safety products; and The Home Depot present Operation Save-A-Life Chicago, a public service program designed to get life-saving smoke and carbon monoxide (CO) alarms into the hands of at-risk families and provide fire and carbon monoxide (CO) safety education. Fire and CO fatalities are often preventable through education, the proper use of smoke and CO alarms and basic prevention tips. The Operation Save-A-Life campaign underscores the importance of remembering to test smoke and CO alarms weekly and to make sure working alarms, with fresh batteries, are installed on every floor in the home. Missing or non-functional batteries are often to blame for home fire fatalities. Test your smoke and CO alarms weekly, and replace at least every 10 years. Place smoke alarms inside and outside of all sleeping areas. Install a working CO alarm on each floor of your home. Teach your children about fire safety. According to the Chicago Fire Department, 67 percent of all homes with fire fatalities did not have any smoke alarms, and 13 percent had smoke alarms that did not work. Through the help of programs like Operation Save-A-Life, Chicago has seen a decrease in fire fatalities with only 14 in 2016 as compared to 55 in 2003. Fire Commissioner Jose Santiago said, "The ongoing relationship of the CFD and ABC 7 has no doubt saved many lives by educating the public on fire prevention and awareness of requirements for smoke and carbon monoxide detectors in Chicago. Fire deaths continue to trend lower in Chicago and are pleased to continue this longstanding program." "ABC 7 is proud to continue its long-standing commitment towards the goal of reducing the total number of fire deaths in the Chicago area," said John Idler, President and General Manager, ABC 7 Chicago. "Kidde is a world leader in the fire safety products industry," says Sharon Cooksey, communications manager, Kidde. "And we recognize that with leadership comes a responsibility to the communities we serve. That's why we actively give back through charitable programs like Operation Save-A-Life."